Wedding at St Gregory Church Sudbury. I shot this image whilst assisting a fellow photographer, Joe Dormer, to photograph a wedding in Sudbury a couple of years ago. Joe went off to photograph the bride getting ready at home whilst I photographed the groom at the church, we later met up to photograph the rest of the wedding together. 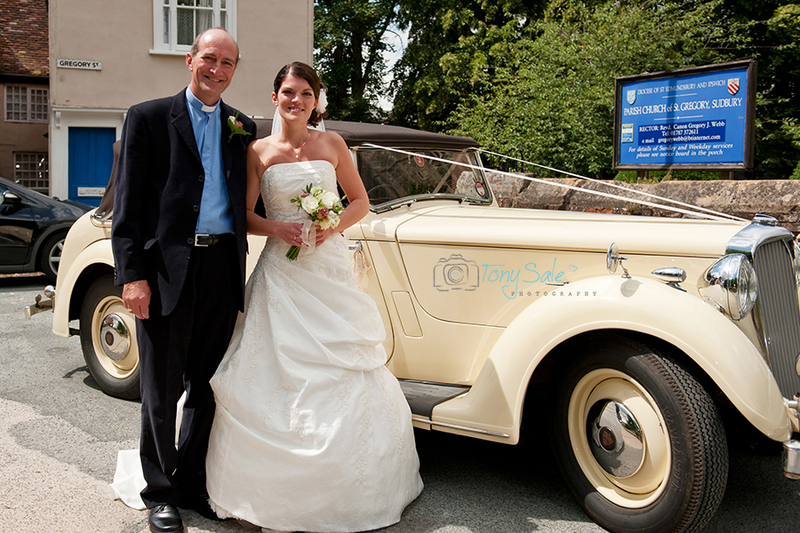 The ceremony at the church and then the reception at The White Hart Hotel in Great Yeldham. The reason this image stands out for me is because the vicar seen here standing with the bride is also her father and he uniquely went on to perform the most part of the actual wedding ceremony. There is something very special I think about being in a position to marry your own daughter and also something very wonderful to have your own father carry out your wedding ceremony. When I look at the expression on his face, to me it just radiates his pride and his joy. His pride and joy in that very moment as he sees his daughter in her wedding dress for the first time and also as he thinks of the moments ahead when he will conduct the marriage ceremony. Although at a much lower level it also resonates with me that the church is called St Gregory’s and is in Gregory Street and the name of the bride’s father is Revd Canon Gregory J Webb. It’s my intention to choose an image each week as my image of the week and to reflect upon it and tell you why I chose it. Please do come back and see more of my choices and please do feel free to share the image and leave your thoughts/ comments below.